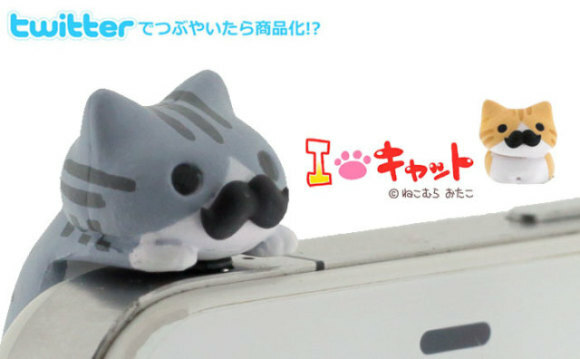 These cuter than cute mustachioed kitten phone jack plug accessories take the wildly popular series of Nyanko Type Earphone Jack Covers to the next level. You can choose from ginger Tora or gray striped Mimi but it's impossible to pick which one's the cutest: they BOTH are! First, a little back-story on the Nyanko Type Earphone Jack Covers. Japanese manga artist Otako Nekomura is a huge fan of cats, especially cute ones, who was frustrated at the lack of cute cat smartphone accessories – hard to believe, but true. She decided to sketch her ideal kitten-related smartphone accessory on a table napkin and then tweeted it to her followers. Someone who works for a mobile device accessories firm noticed her tweet and somehow convinced his higher-ups to produce what would be known as Nyanko Type Earphone Jack Covers featuring Mikeneko, Mimi, Shiro and Kuro, Tama, Buchi and Tora. Good thing she didn't accidentally include incorrect measurements on that napkin! But we digress. Mobile phone accessory manufacturers have raised the bar for Nyanko Type Earphone Jack Covers – to 11, some might say – by giving two of them Mr Pringle style mustaches. The Tora and Tama plugs (available at Amazon.com) are compatible with mustache-lovers, cat-lovers, and any smartphone with a 3.5mm earphone jack. Niconico Nekomura Cat Earphone Jack Plug Accessories, Mustache Edition are made from PVC plastic and are priced at $4 to $5 each. It's a pretty cheap price to pay for the instant silly grin you'll sport every time you use your smartphone, MP3 player or similar mobile or static device.